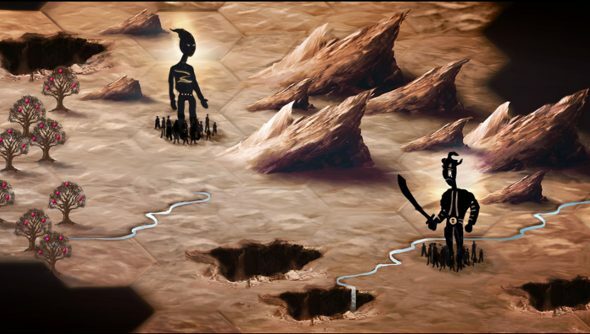 Unwritten, an intriguing turn-based strategy title where players must guide a tribe across a dangerous wilderness – described by the team as Civilization meets Oregon Trail – has hit an unfortunate road bump after being successfully Kickstarted early last year, encapsulating the unfortunate side-effect of these crowd-funded, personal game projects developed by tiny teams. The project is – as developer Joe Houston emphasises in a Kickstarter update – still ongoing, it’s just on life support. The budget was wrong, the estimated development time was wrong, and Joe’s been struggling to work on the game while also supporting his wife and daughter during a period of crisis. Unwritten is not technically cancelled, but it’s in a lot of trouble. In a more recent update, Joe’s clarified the situation. “There have been some comments that express frustration that the game doesn’t continue slowly in what time I can find. However, that’s exactly what’s going on right now. The game is continuing forward. However, the premise of the Kickstarter phase of the project was a short fulltime effort from me and my team (with monthly updates at the very least), and this is no longer true. This is why I felt it was the right thing to notify the backers. Without the safety net of a publisher handling the business side of things and a large team where one can delegate, Kickstarter projects are full of huge risks like this. There will undoubtedly be those who will feel betrayed, even though funding a project through the platform never guarantees that a finished product will enter your possession. Joe does seem to be committed to ensuring that everyone who wants a refund will get one, however, and those who want to stick it out and hope that the game will become a reality can do so. But it’s a sad state of affairs, and not one that could have been predicted, as family crises are never planned.